Have you ever taken a moment to reflect about your thoughts on Money? Last week, I was on Facebook Live teaching on the mana, spiritual essence and potential power, of money. The conversation was enlightening. Think about the energy in thoughts like these. In the moment, what begins as very practical and logical thinking easily turns into emotional energy and upset. Notice how our thoughts, our mind and our emotions become invested in this thought pattern and story. We start looking for confirmation that our thoughts are “right”. Over time, our spiritual capacity to shift those thoughts can wane. What comes next is inevitable: we bring that very experience of money into our physical reality. My answer to that is yes, yes, yes. You have God-given skills and talents. You may have education, certifications and experience. Of course you should be supported financially for the work that you do. No matter what your spiritual affiliation is – Buddha, God, Universe – your guides and angels and ancestors and spiritual source want the absolute very best for you. This is an invitation to the see the very best in yourself as well. As you begin to value yourself, others take notice and also begin to value what you have to offer. The very definition of wealth should be the ability to be generous. (Side note: studies show the poor are actually more generous) If you have been blessed with financial freedom, it didn’t come out of nowhere. You may have been blessed and inherited status by the hard work of your ancestors, those that came before you. You may have forged your own path to build what you have. In today’s society, some people react when you share your success and see it as bragging. Those viewpoints do not go together at all. You can have wealth AND humility. We can welcome blessings, be inspired by and celebrate success stories. You have the ability to create abundance. In addition, we can share that abundance and allow generosity to pour out of whatever has been created or co-created with our world. You CAN have wealth and still be humble. If you are practicing your spiritual gifts, you don’t need to struggle. Especially not if you are serving. You should absolutely be supported by the things that you share. You have limitless value. The world is waiting for the very specific gifts and skills that you have to share. They’re waiting for you to recognize all of the gifts that you bring. To see the value of your work and love what you do. To know you are worth it. Serve your world with what you love and be financially supported by your healing gifts. Money is just a way of creating movement in and out. Thoughts like, “If I want money and abundance, that means I’m greedy” block your power. Be careful, not to block your ability to have a pono, right and balanced, energetic exchange for the amount of effort and mana that you pour out. Dollar signs. Appreciation. Emotional support. All appear as an energy form of mana. Doing what you love to do may not bring in a billion dollars. Trust that it will bring what you need because that is what spirit wants for you. You have a part in manifesting what you need as well. Know your expenses. Plan for the future. Take responsibility for your desires and dreams. When you put energy towards believing your dreams are possible, you create an opening to bring them in to reality. You bring them closer to your physical awareness and experience and then the universe can send them your way. You deserve it. If you need some support or help in flipping the script on any old thought patterns, I am here to help. Maybe it was a belief that was passed down to you. Possibly your previous life experience brought you an unwanted story. I want you know there’s something greater. Ho’oponopono is an ancient Hawaiian practice to make good, more good. Right, more right. Whole and balanced, more whole and balanced. 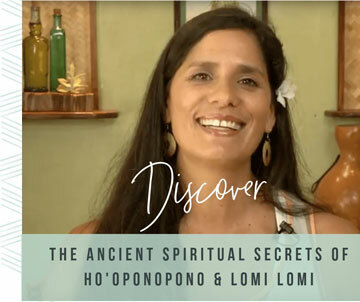 I have a free masterclass, Ho’oponopono: the Hawaiian system for living in harmony with yourself, with others and the Divine. In this video training, you will learn how to release whatever it is that is keeping you from those dreams and desires. I will show you how to recognize divine guidance so that you can bring in exactly what you need, what you deserve and what will bring value to your experience in this life. Sign up for the free masterclass here. What are some thoughts you are ready to release about money? I read every comment so please share a comment below.